Bits and pieces from our travel - AoaT. No matter where I go, I keep a lazy eye out for beer and surprise beer finds. It’s fun finding something that doesn’t have a heap of information online and then being able to share that with everyone. Here are a couple from our recent trip. We had a 7 hour stopover in Singapore, and while I love Singapore airport, I’ve spent far too much time there over the last few years to want to spend another 7 hours. We decided to jump in a taxi and head into the city for some hawkers market delights, and to try find Good Beer Company Singapore. Fortunately for us, they are located in a hawkers market (Chinatown Complex). I had been told it is difficult to find, and we foolishly didn’t do a heap of research before heading in. All we really knew was that you could see it from the road. Given that information we figured if we walked around the edges we would find it. It took us a while, and we had to ask at a dumpling place, but we found it, in the far back corner from the stairs/entrance (there was construction happening at the time so the entrances may be changing). We had to walk over a little footbridge and past the toilets, then keep going into a greenish coloured section of the market and it’s right at the back. 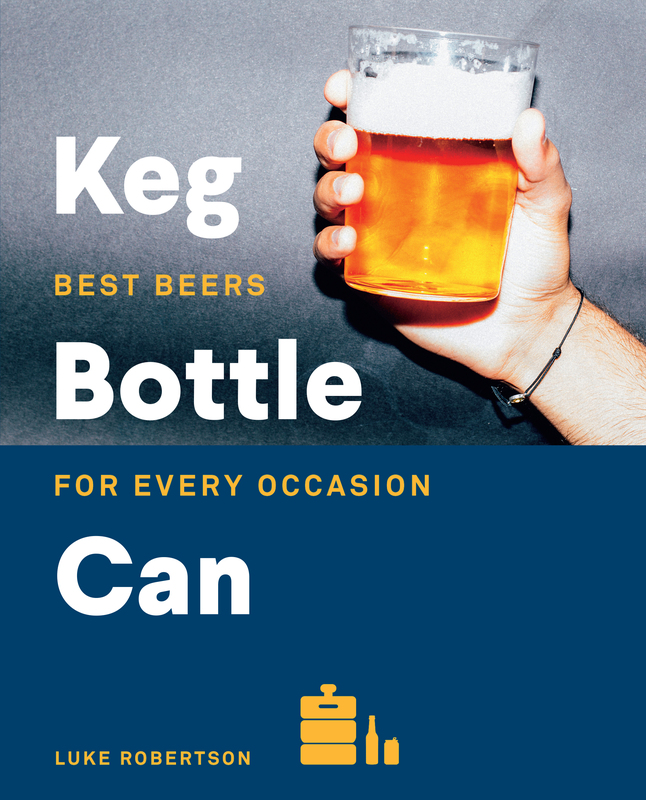 The selection is solid, with two taps and a range of bottles from around the world. 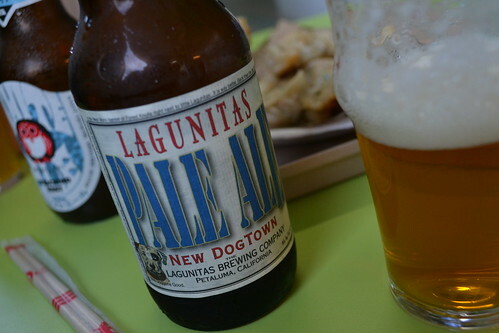 I had a Lagunitas Pale, and Emma went for a Hitachino White. We also snuck back to get a plate of dumplings from the seller who gave us directions. 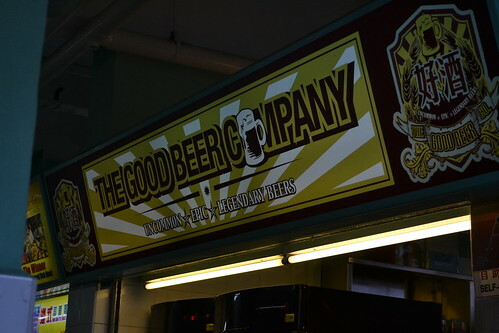 Finding good beer in Singapore is difficult and Singapore is an expensive city (I’ve paid $15 for a bottle of Tiger, and $12.45 for a VB before; see this post), so having reasonably priced (comparatively), great beer in a hawkers market is a welcome addition, especially given dinner for two won’t run you much more than $10. Plus it only takes about 20 mins to get into the city from the airport so it’s easy to do if you have a bit of a stopover. We only had two days in Paris but I was determined to find some good beer along the way. I had been given some tips, but the two that came up the most were La Cave a Bulles, and La Fine Mousse. The former is a bottlestore and the latter is a bar run by the same people. 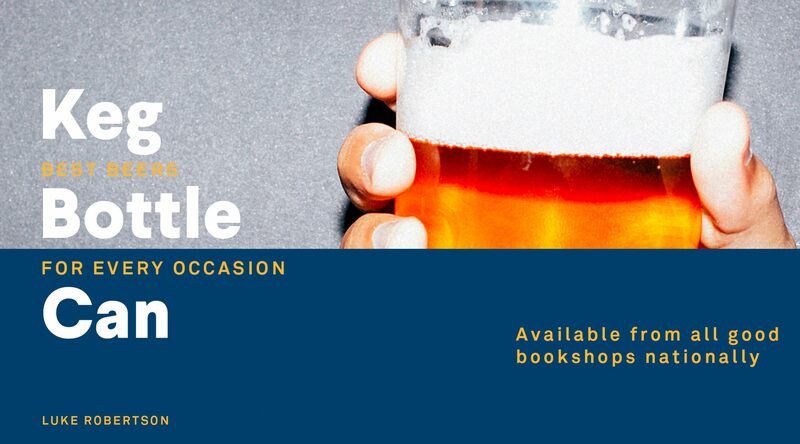 We decided to check out the bar – given our next stop was Belgium, buying beers for takeaway seemed a little like taking coals to Newcastle, as the saying goes. 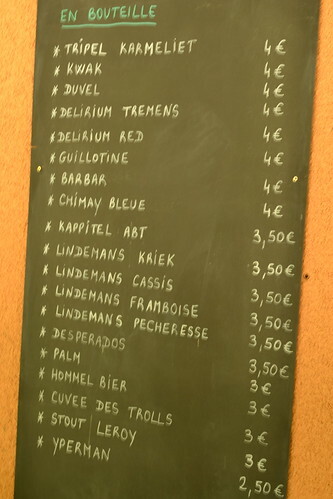 They have a solid range, about 70% French beers some Brewdog’s, and Belgians (Tilquin Gueuze, Cantillon on tap). Definitely a good choice for anyone wanting to check out a few local brews. 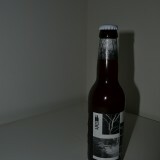 The highlight that day was the “Tasty Pale Ale” from Brasserie Outland. A 3.5% APA which hits all the right notes for a session beer. A bit of a letdown was the Craig Allen Agent Provocateur, which is a well regarded beer but ours was loaded with diacetyl. On the upside, I can taste diacetyl again (buttery/oily taste caused by fermentation issues and definitely not desirable in a beer such as this, which is a Belgian IPA). 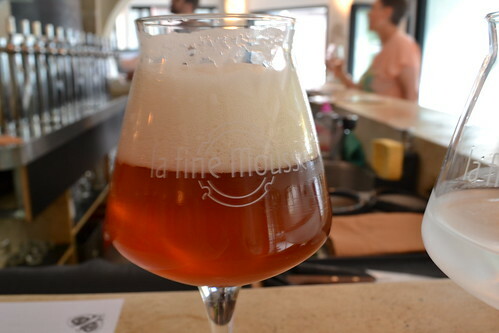 Anyhoo, La Fine Mousse was a great stop and it’s exciting seeing French beer showcased in a nice place, alongside some of the bigger names. After our Belgian trip, we had booked an apartment in a town in the south of France called Barjac. Given the season, we found it difficult to find accommodation in the major cities so Emma just chose a town on the map and found a place that could accommodate 5 of us (Emma’s sister and two friends joined us for this leg). 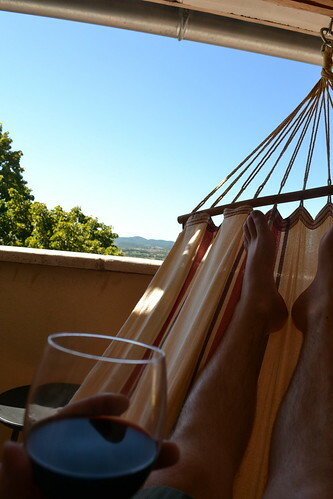 Barjac is about 1 and a half hours from Avignon, atop a mountain and really quite far away from anything else. We drove up in a storm. Moving slowly, with thunder and rain around us I caught a glimpse of a “Watou’s Wit” poster. 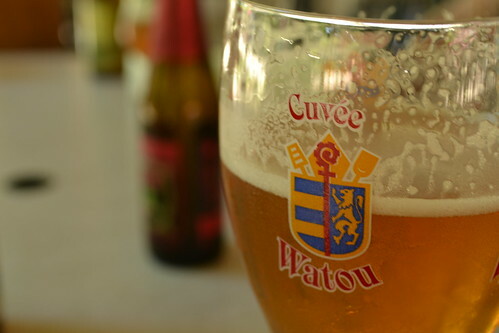 Watou is the Belgian town home to St Bernardus and Brouwerij Van Eecke, and Watou Wit is a beer from the latter brewery. Obviously it caught my eye. Given I had expected to only be drinking French wine (life is tough) and a few beers from our Belgian stash, I was interested to spot such a thing in this part of the world. A couple of days later we stopped in on the way back from a wine tasting… I guess I should mention the wine first. Being France in August, some of the places we wanted to visit were closed. We ended up finding a place called “Domaine Clavel” and stopped in for a tasting. I would never claim to be an expert on wine, but the reds from that winery were some of the best I’ve tried and since returning we’ve grown a new fondness for wine from the region – last night we even sought one from our local bottle store, and the only beer had at our Sunday dinner was in the gravy. That has never happened before. Driving into Camping La Plage, we were quick to notice the “Hommelbier” umbrellas. Hommelbier was one of our favourite beers from our time in Belgium. 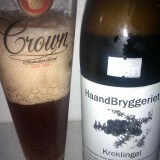 Very easy to find and had a decent hop profile with a really nice Belgian finish. At 7.5% we almost treated it like a session beer on our trip, and as breweries around the world clamber to do Belgian style IPAs, a style which I generally dislike, it was welcome to find a Belgian pale with a more assertive hop profile done so well. Those Belgians really know how to make beer. They had a few beers on tap and a great bottle list (above). It was an excellent find and if we were to go back we would probably camp in their grounds. Right next to the river with a private beach it would be the perfect way to spend a few days drinking local wine and Belgian beer. So if you’re in that part of the world and want a beer, this is the place. Stuck in the middle of nowhere but definitely worth a look. Barjac itself was amazing also. We stayed here: http://maisonmartinet.com/Maison_Martinet/Welcome.html. It’s a perfect little town with a few restaurants and and great little wine shop which happened to be at the base of our apartment steps (safe to say it took about a day for us to be regulars). Every friday there is a local market which sprawls through the town centre and features cheeses, cured meats, and I had a life changing experience with some locally made framboise (raspberry) nougat. I should also mention that the wine shop, along with a bar (which I forget the name of, but it’s run by an Algerian who was awesome and gave us free beer. 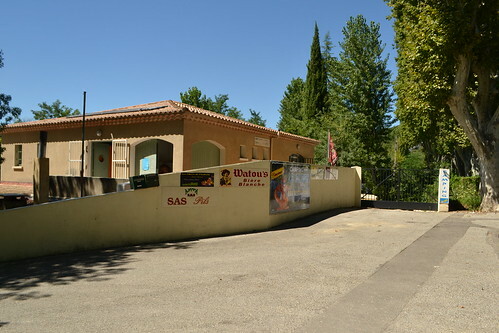 It has a covered beer garden out the front, and doesn’t look touristy like the others), have beer from La Barbaude, a brewery in nearby Nimes. They weren’t too exciting but the witbier and the golden definitely held their own, so keep an eye out if you’re in the ‘hood. And that’s the end of our holiday. Obviously we did more than just wine and beer but this isn’t a “what Luke did on holiday” blog. Even I wouldn’t read that. 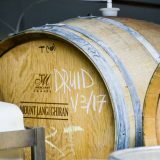 Next story Aged and Cellared. Enjoyed reading this post. Appreciate the Singapore tip. Not sure if I’ll get to Europe any time soon, but gees it sounds good. And back to Belgium as well of course… no to work out where to find the money. W00t for La fine mousse getting your attention- I was just there last night talking with one of the owners about up coming Zwanze Day. Truly the best Paris beer geek location. On the other hand, if you cruise through Paris again and don’t want to take the distance run for better quality try Express de Lyon. It is much more central being across the street from the Gare de Lyon and will hand over local flavor with acceptable intrigues (not exactly French beers, but good beers). Thanks for the tip – annoyingly we were at Gare de Lyon with 2 hours to kill at the end. That would’ve been perfect.